Ann-Marie Dornn was born and raised on a Hutterite colony in Manitoba, Canada. In this religious community, everything is shared among all the people who live there. The community gathers together for meals, and life runs smoothly as each person works hard to ensure their tasks are completed each day. As a child growing up on the colony, Ann-Marie was filled with happiness. But her parents were continuously struggling with conflicts in leadership. And when Ann-Marie was just 10 years old, they left the colony, entering the "English" world where they had to fend for themselves with no community to help them. In I Am Hutterite, Mary-Ann Kirkby takes us back to her childhood, when she was called Ann-Marie and lived within the Hutterite community. But first, she takes us back further to tell us her parents' story of how they came to live on the colony. 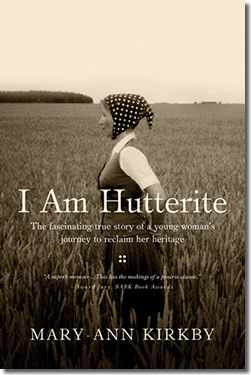 I didn't know anything about Hutterites before reading this book, so the history was interesting. But I have to say this part of the book didn't read like a memoir. It was written more like a historical record of her parents' life. I didn't feel a lot of emotion and connection to her parents as I was hoping to learn more about her personally. I do understand the need to tell a bit about your parents when you're telling your own life story, but I felt like the background about her family was a bit long and included so many different people, I started to lose track! From here, she went on to tell about her life as a child on the colony. I enjoyed hearing about life on the Hutterite colony, but there wasn't a lot of feeling behind the words. Perhaps this is because she was pretty content with her life at that point. When her parents take her and her siblings away from the colony, about halfway through the book, I finally saw more feeling in her writing. It was interesting to hear about the first few years of trying to assimilate into the "English" community. I honestly wish she had gone further though. I had expected to hear a lot more about her life beyond the colony than what was given. She touches on her adult life very briefly at the end, but I would have enjoyed hearing more. If you are interested in Hutterites or the concept of community life in general, I do recommend this book. It's an interesting look into the inner workings of a Hutterite colony and the sense of community one finds within it. This review was written based on a copy of I Am Hutterite that I received from Thomas Nelson in exchange for an honest review.